It’s simply the best turkey I know how to make. But what if there was a different way to cook, a better way? I searched my memory for the turkey I learned to make half a lifetime ago at La Varenne cooking school in Paris. The French didn’t know from wood smoke. They still don’t. But they did use a technique singularly well-adapted to our well-endowed American turkeys where the ample breast meat tends to dry out. The secret? Loosen the skin from the bird, place herbed butter laced with cognac between the skin and the meat, and roast the bird at a moderate temperature. You’ll get to practice some avian surgery and get a great turkey in the process. In a nutshell, the butter melts into the breast meat, keeping it moist and adding extra flavor. Of course, back in the day, we also placed paper-thin slices of fresh truffle under the skin. Truffle is that fragrant tuber found in France and Italy that costs as much per pound as a plane trip to Paris or Rome. But you can get amazing results if you use a mix of fresh herbs. So how do you loosen the skin from the meat? Very carefully. I explain how in the recipe. (You can also check How to Grill for step-by-step instructions.) The technique feels a little strange at first, but with practice, you’ll become a pro. As the great 20th century chef Fernand Point exclaimed when asked the secret to great cuisine: “Du beurre, du beurre, et encore beurre!” (“Butter, butter, and more butter!”) Amen! 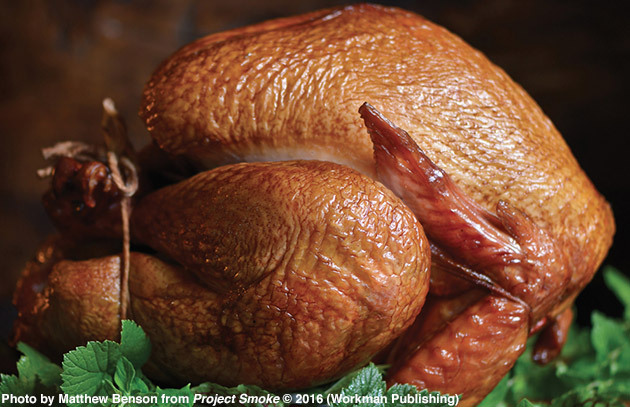 Get the recipe for Smoke-Roasted Turkey with Cognac Herb Butter.